سورنجان یا گل حسرت یا گل حضرتی نام یک سرده از راسته سوسن‌سانان، تیره گل‌حسرتیان است. سورنجان سرده‌ای است علفی با حدود ۳۰ گونه که بومی اوراسیا هستند؛ گل‌های آن‌ها بدون ساقه و شبیه گل زعفران است که در پاییز می‌شکفد و به آن‌ها زعفران پاییزه یا چمنزار گفته می‌شود؛ میوهٔ آن‌ها پوشینهٔ سه‌حجره‌ای است که در بهار، زمانی که برگ‌ها ظاهر می‌شوند، می‌رسد. سورنجان در نقاط معتدل و مرطوب می‌روید. پیاز آن در عمق ۲۵ تا ۳۰ سانتیمتر در خاک فرومی‌رود و در پائیز گل‌های سفید یا بنفش شش بخشی از آن خارج گردد؛ و این گل‌ها لوله دراز دارند و تخمدانشان بر روی پیاز قرار گرفته‌است. پس از آمیزش قریب شش ماه در خاک باقی می‌ماند و تخمدان بزرگ می‌شود و در بهار با برگ‌های پهن و براق از خاک بیرون می‌آید و کپسولی سرخانه می‌سازد که دانه‌های درشت بسیار دارد. این گیاه بسیار سمی و ماده مؤثر آن به نام کلشیسین در بیماری نقرس بکار می‌رود. ↑ «گُل حسرت» [زیست‌شناسی- علوم گیاهی] هم‌ارزِ «Colchicum»؛ منبع: گروه واژه‌گزینی. همان، ویراستار. دفتر هشتم. فرهنگ واژه‌های مصوب فرهنگستان. تهران: انتشارات فرهنگستان زبان و ادب فارسی. شابک ۹۷۸-۶۰۰-۶۱۴۳-۰۸-۸. در ویکی‌انبار پرونده‌هایی دربارهٔ سورنجان موجود است. "Bulbocodium" redirects here. For the daffodil, see Narcissus bulbocodium. Hermodactylum (R.Br.) Bartl. nom. inval. Colchicum (/ˈkɒltʃɪkəm/ or /ˈkɒlkɪkəm/) is a genus of perennial flowering plants containing around 160 species which grow from bulb-like corms. It is a member of the botanical family Colchicaceae, and is native to West Asia, Europe, parts of the Mediterranean coast, down the East African coast to South Africa and the Western Cape. In this genus, the ovary of the flower is underground. As a consequence, the styles are extremely long in proportion, often more than 10 cm (4 in). All species in the genus are toxic. The common names "autumn crocus", "meadow saffron" and "naked lady" may be applied to the whole genus or to many of its species; they refer to the "naked" crocus-like flowers that appear in late summer or autumn, long before the strap-like foliage which appears in spring. Colchicum and Crocus look alike and can be confused by the casual observer. To add to the confusion, there are autumn-flowering species of crocus. However, colchicums have 3 styles and 6 stamens, while crocuses have 1 style and 3 stamens. In addition, the corm structures are quite different—in colchicum, the corm is irregular, while in crocuses, the corm is like a flattened ball. Crocus is in the Iris Family, Iridaceae. The scientific name comes from the Colchis, a region in Georgia (Caucasus) known to the Ancient Greeks by that name and mentioned in their mythology as the destination of the Argonauts and the place of Medea and the golden fleece. Colchicum melanthioides, also known as Androcymbium melanthioides, is probably the best known species from the tropical regions. In contrast to most temperate colchicums, the flower and leaves are produced at the same time, the white flowers usually in a small corymb that is enclosed by white bracts. Close relatives such as Colchicum scabromarginatum (Androcymbium scabromarginatum) and Colchicum coloratum (Androcymbium burchellii) have flowers with very short stalks and may be pollinated by rodents. Those marked agm have gained the Royal Horticultural Society's Award of Garden Merit (confirmed 2017). In the United Kingdom, the National Collection of colchicums is maintained at Felbrigg Hall, Norfolk. Plants in this genus contain toxic amounts of the alkaloid colchicine which is used pharmaceutically to treat gout and Familial Mediterranean fever. The use of the roots and seeds in traditional medicine is thought to have arisen due to the presence of this drug. Its leaves, corm and seeds are poisonous. Murderer Catherine Wilson is thought to have used it to poison a number of victims in the 19th Century. The species known to contain the most lethal amount of colchicine is C. autumnale. The following are the species included under Colchicum. Many species previously classified under Androcymbium, Bulbocodium and Merendera were synonymized under Colchicum based on molecular genetic evidence. Androcymbium is currently considered a separate genus by some. Colchicum asteranthum Vassiliades & K.M.Perss. Colchicum atticum Spruner ex Tommas. Colchicum imperatoris-friderici Siehe ex K.Perss. Colchicum schimperi Janka ex Stef. Colchicum serpentinum Woronow ex Miscz. Colchicum sieheanum Hausskn. ex Stef. ^ "WCSP". World Checklist of Selected Plant Families. Retrieved February 10, 2014. ^ "Colchicum - Define Colchicum at Dictionary.com". Dictionary.com. ^ Barceloux, Donald G. (2008). Medical Toxicology of Natural Substances: Foods, Fungi, Medicinal Herbs, Plants, and Venomous Animals. Wiley. pp. 693–702. ISBN 978-0471727613. ^ Ciara Kleizen, Jeremy Midgley & Steven D. Johnson (2008). "Pollination systems of Colchicum (Colchicaceae) in Southern Africa: evidence for rodent pollination". Annals of Botany. 102 (5): 747–755. doi:10.1093/aob/mcn157. PMC 2712380. PMID 18723860. ^ "RHS Plant Selector - Colchicum 'Pink Goblet'". Retrieved 16 June 2013. ^ "RHS Plant Selector - Colchicum 'Rosy Dawn'". Retrieved 16 June 2013. ^ "RHS Plant Selector - Colchicum 'Waterlily'". Retrieved 16 June 2013. ^ Stuart, M. (1979). The Encyclopedia of Herbs and Herbalism. Orbis Publishing London. ISBN 0-85613-067-2. ^ Huxley, A. (1992). The New RHS Dictionary of Gardening. MacMillan Press. ISBN 0-333-47494-5. ^ Frohne and Pfänder (1984). Colour Atlas of Poisonous Plants. Wolfe. ISBN 0723408394. ^ Stary, F. (1983). Poisonous Plants. Hamlyn. ISBN 0-600-35666-3. ^ Altmann., H. (1980). Poisonous Plants and Animals. Chatto and Windus. ISBN 0-7011-2526-8. ^ "Search results — The Plant List". theplantlist.org. ^ John Manning, Felix Forest and Annika Vinnersten (2007). "The genus Colchicum L. redefined to include Androcymbium Willd. based on molecular evidence". Taxon. 56 (3): 872–882. JSTOR 25065868. ^ Karin Persson (2007). "Nomenclatural synopsis of the genus Colchicum (Colchicaceae), with some new species and combinations". Botanische Jahrbücher. 127 (2): 165–242. doi:10.1127/0006-8152/2007/0127-0165. ^ Alberto del Hoyo, José Luis García-Marín & Joan Pedrola-Monfort (2009). "Temporal and spatial diversification of the African disjunct genus Androcymbium (Colchicaceae)". Molecular Phylogenetics and Evolution. 53 (3): 848–861. doi:10.1016/j.ympev.2009.08.005. PMID 19699811. ^ "Colchicum atropurpureum Stapf ex Stearn — The Plant List". www.theplantlist.org. Retrieved 2018-12-20. 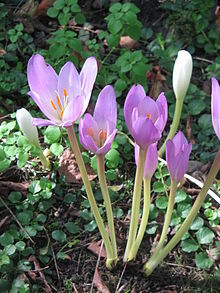 Wikimedia Commons has media related to Colchicum. این صفحه آخرین‌بار در ‏۲۱ مهٔ ۲۰۱۸ ساعت ‏۰۸:۱۹ ویرایش شده‌است.